It's time to practice writing a short report of an event that occurred recently or something that you viewed on TV. You can view it several times to collect the details that are important to the report. Then organise your ideas by writing the information in sentences in the three paragraphs below. Here is a short video news report which we can write up as a report. 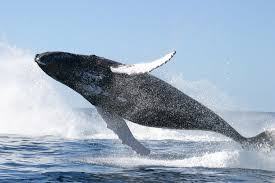 And here is a humpback whale. You might also need to use the following words: 'yacht' and 'Moreton Bay'. Here is a possible News report (answer sheet) about the experience with the Humpback whale. This dictation is a little different to others we have done this year. Listen to the sentences and try to write as much as you remember. But this time, you don't have to write exactly what you hear as long as the meaning is similar. The main thing is that your sentences are grammatically correct and they make sense - the reader can understand the meaning. Did you miss.... in Week 5 and 6? Here is the News item we read last Friday: Small town a new horizon for 19 citizens. The last two pages have some possible answers - you can write different sentences - just check spelling, grammar and punctuation are correct. Thanks to Jane Lucas for adapting the text and developing the reading tasks. Practice writing notes for work - the first page of this worksheet has space for you to summarise the notes using dot points - the second page has the ANSWERS. Thanks to Sophie for her answers. The second news report is: Man impaled through head on Sydney construction site from Yahoo CH 7 news service. You can use the above Write a News Report template to help you plan, organise and write your report. Here is the worksheet: Reported statements with a change of tense for you to print and complete. When you are finished you can check your answers - on pages 3 and 4. This is what kids do in school! This video introduces the different voting systems, including preferential voting. Listen and test yourself with the quiz afterwards.